The Shaolin Neijin Qigong or Shaolin Neijin Yizhichan originates in the meditation practice of the northern Shaolin Monastery and is dated about 500 years after Christ. Later on the method was preserved and further developed in the southern Shaolin Monastery. It had been introduced to a broader public for the first time by Great-Grandmaster Ashui Que, who had left the Monastery in 1945. After him Grandmaster Jinsheng Yao contributed intensively to a further spreading as the bearer of the knowledge in the 19th generation. He finally gave the responsible task to spread the Shaolin Neijin Qigong in the western world to the single authorised representative of the direct Master line Grandmaster Buyin Zheng. The Grandmasters Jinsheng Yao and Buyin Zheng visiting the wife of Great-Grandmaster Ashui Que (2007). Being a crucial, meditative part of Chan Buddhism, the Shaolin Neijin Qigong belongs to those authentic Qigong systems which were traditionally and purely handed-down. It shows all the verifiable aspects like a clear Master line, a stepwise level of training and level of abilities and the training of body and mind. Chan indicates a special form of Buddhism and among other things a deep meditation which aims to develop compassion and to arise wisdom. 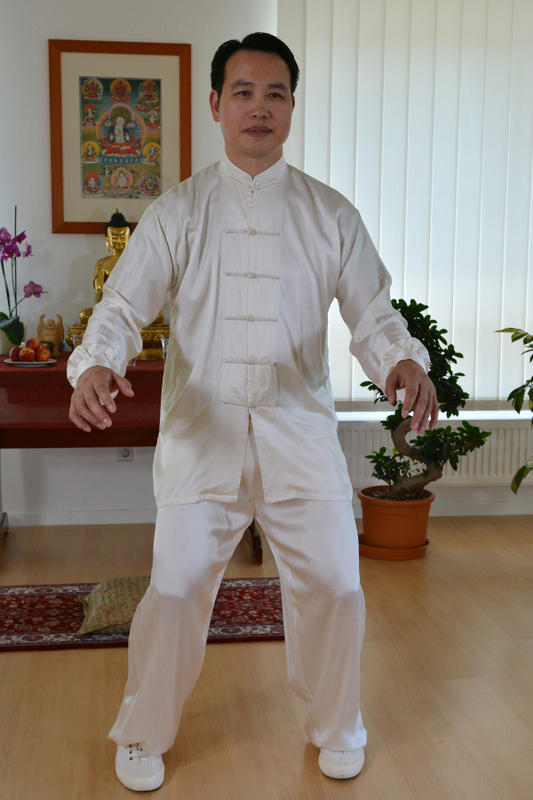 A central importance in Shaolin Neijin Qigong has the so called riding stance. 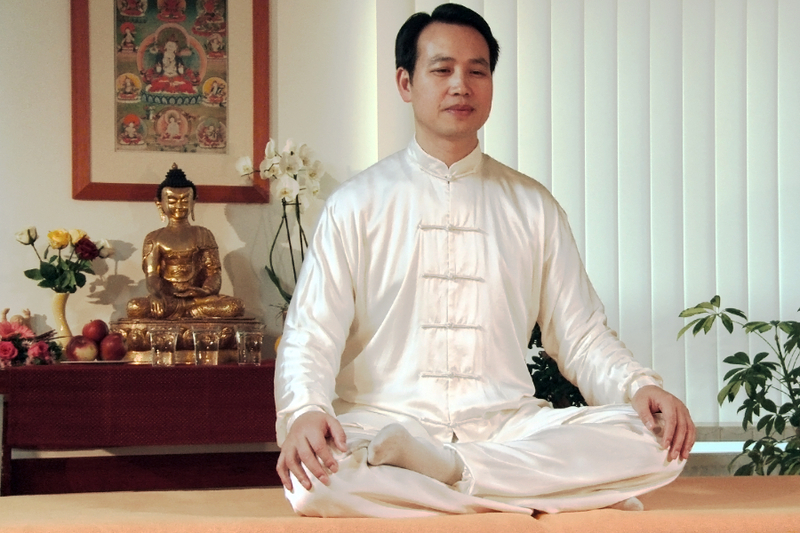 The practitioner meditates, ideally on a daily basis, for a longer period of time in an exact, predefined position, similar to the sitting position of a rider. This position calms the mind, opens the Meridians to a great extent and creates a free flow of Qi. It is important to only practice this exercise according to preparation and precise instruction. One starts practising over a shorter period of time and increases the duration to 35 minutes, if possible. Experienced practitioners enjoy the effects of this standing-meditation for a period of one hour or more. Besides the riding stance further clearly instructed standing figures are being practiced in Shaolin Neijin Qigong on a more advanced level, like for example the “Tiger” and the “Dragon”. Visiting Chinese Monasteries, one may find imageries of saints, the so called Louhans, which show such positions. Without any special concentration or mental imagination those defined body positions guide the flow of Qi in a way so that naturally blockades dissolve. 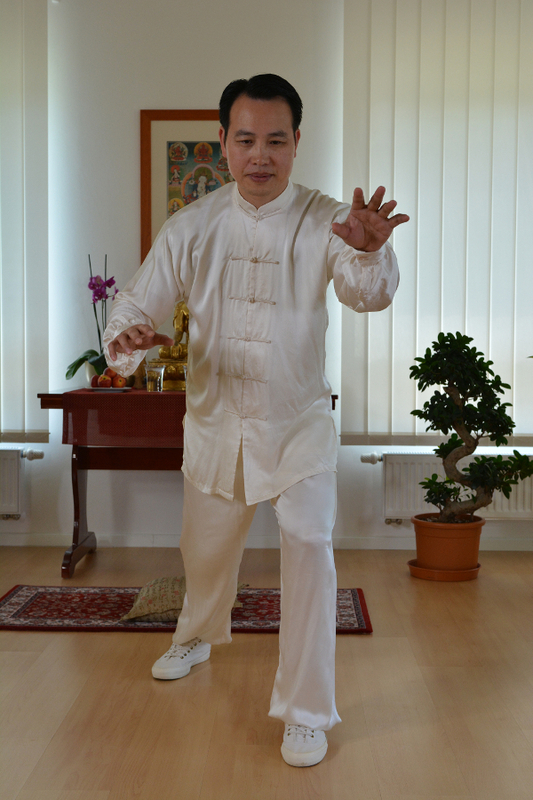 Finger exercises are a special feature of Shaolin Neijin Qigong. Embedded in the riding stance, special finger exercises which were chosen by an authorised master are passed on to the practitioner. Those finger exercises open a special potential of Qigong: They are able to influence directly central acupuncture points of the Meridian-system and to open those as well as to make it possible that external Qi may be absorbed and internal Qi may flow out of the body. Moreover the finger exercises are the precondition for an effective energy transfer. 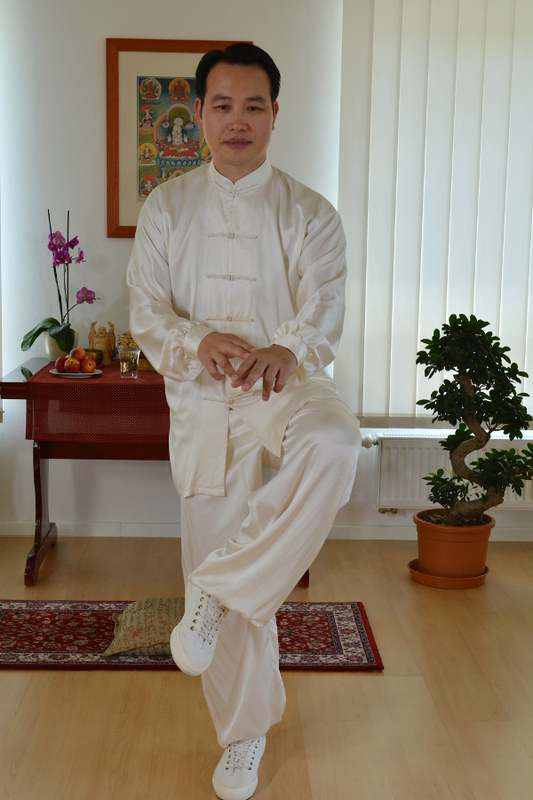 With the Shaolin Neijin Qigong method there are, apart from exercises in standing, also exercises which are practised in a sitting or lying position. 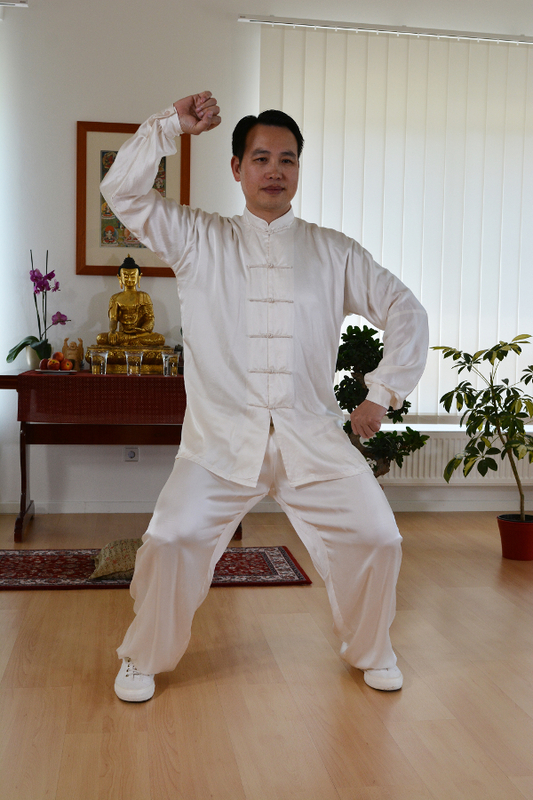 As well as the exercises in standing they serve to accumulate and consolidate the inner strength. Moreover they unfold a regulating effect on the body, the breathing and the mind. It is favourable to combine the exercises in standing with exercises in sitting or lying. These may be special exercise variations or a continuation of the exercises which one already practised while standing. The exercises in a sitting and in a laying position can be practised by healthy people as well as by those who suffer from a weakened health and therefor are not able to practise in standing (for a longer period of time). For one the energy transfer of Shaolin Neijin Qigong opens the effective possibility to transfer healing impulses on the patient and to release energy blockades. If being used by experienced and qualified peoples it is also able to give access to universal knowledge and hidden abilities. The receiver may for example perform Gongfu movements, which he or she did not know previously. 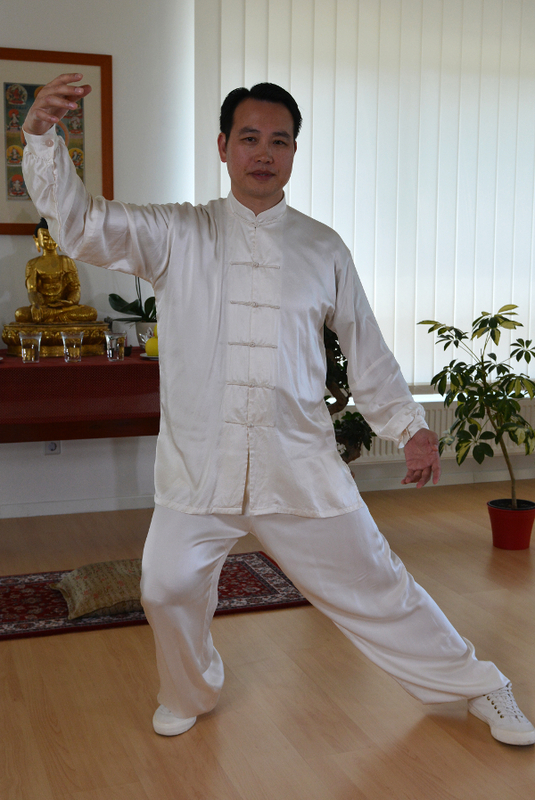 Because of its strong potential the energy transfer is only applied by Qigong practitioners who are responsible, moral and authorized. 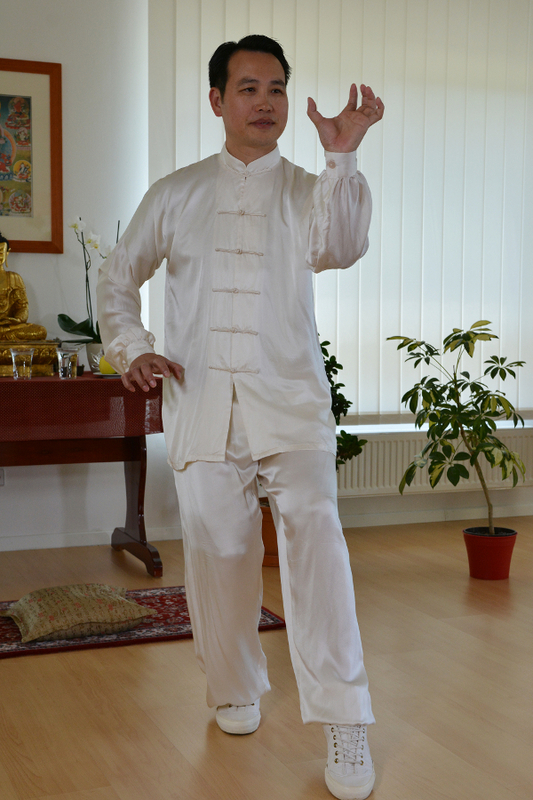 In principle the Shaolin Neijin Qigong exercises are suitable for everybody, for they can be adjusted to the individual state of health. 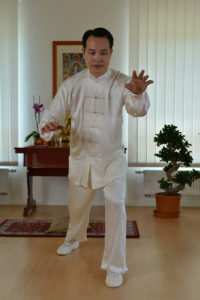 Thus also disabled or seriously sick people can practise special exercises to find a healing energy access. Younger as well as older people profit from the harmonizing exercises, which already after a short period of time lead to a distinctly increased well-being, a better concentration, resilience and balance.